50 slides about Easter in one tidy and ready to go package that should cover about 1 week of active language learning with some arts projects! Absolutely NO PREP! Ready to print and USE as an ACTIVITY PACKAGE! 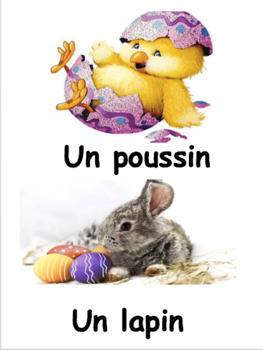 Set of flashcards about: "Pâques" is included too! 17 flashcards!!!! Everything is ready for your word wall. Check out the preview file! Lots of activities to keep your students busy and learning in early April and no prep for you! 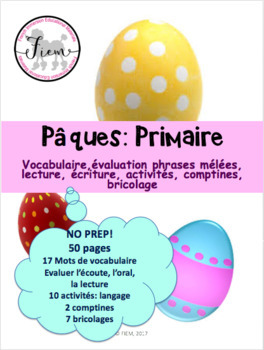 Don't have time to prep for your "Pâques" unit! Use this ready-made vocabulary and activity package with your primary students. It includes a variety of activities to re-invest in vocabulary knowledge and develop writing and reading competencies. Also included in this resource are some hands on activities. To end this unit, you are being provided with 3 evaluation tools. 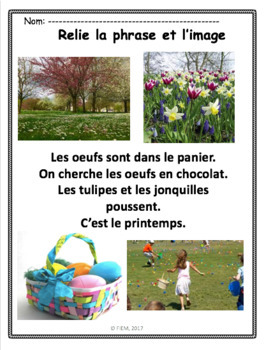 This package includes 50 colourful slides on the theme of: Pâques. The matching slides of "étiquettes de mots"
Suitable for Core French and Primary French Immersion. Please visit my store often as I regularly post new items: FIEM, French Immersion Educational Materials.